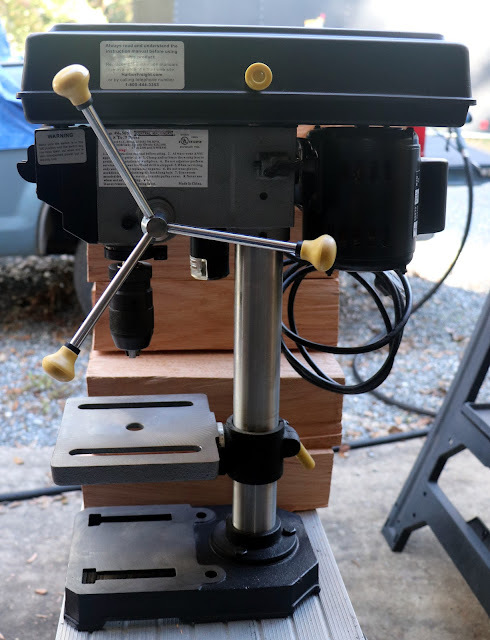 I have a harbor freight bench top drill press that I have used for several years for small bits. It is almost too small and required some fiddling to get the holes drilled in the right place. Not having a crank to raise and lower the table was a real pain. It had a keyless chuck that I found difficult to use and often would get a bit installed crooked. I had already decided to get something different, and through a process of elimination, I chose the Grizzly G7943 as the best solution. A few weeks later a used one popped up on Craig's list. Mit must have been fate. I have kept a search running for Grizzly tools on crags list for several years. Hits are rare and most things I don't want, high prices, or poor condition. This is the first drill press I have seen. I had to buy it. According to the seller, it is about ten years old. Not a big deal since they have changed very little and it wasn't in a commercial shop. It did need some TLC. The user mounted light was a mess. The head was about to fall off. I repaired the light and wired it directly into the drill. I had to remove the top of the drill press to get at the wiring. Getting the spindle pully off turned into an all-day job. It's amazing how many different ways they have come up with to mount a spindle pulley. The built-in light would not work with LED bulbs. After the tom was removed and I could get the light socket out I discovered there was a 1/8-inch lip on the light socket that was keeping the bulb from seating. I was on my way to Home Depot light socket in hand to see if I could find an LED bulb to fit. At the door I thought, I can get a new one from Grizzly if I screw this up, I'm going to remove the lip. Belt sander to the rescue. My Shopsmith belt sander took the rim off in a few seconds. The LED fit perfectly. With these two lights, I now have 1500 lumens on the drill press table. The lights I use are GE Lighting LED Bright Stiks Daylight LEDs. 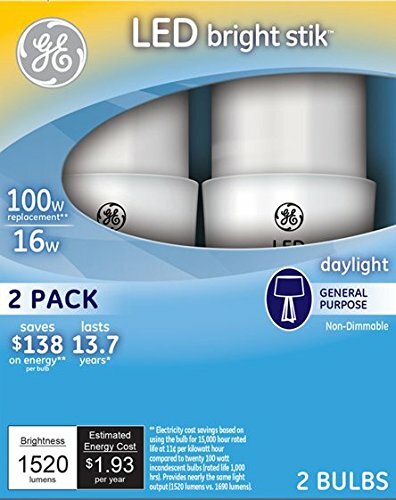 I highly recommend these LED bulbs. 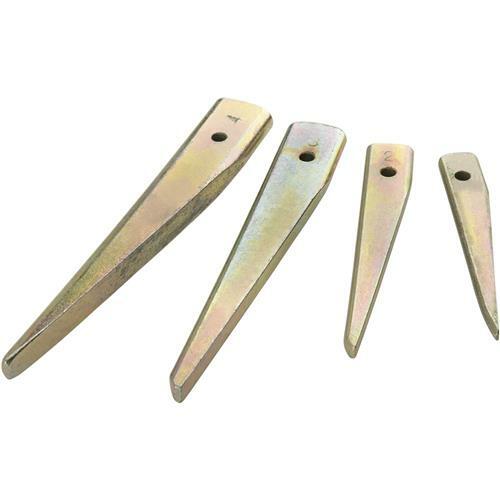 The pulley nut has left handed threads. I had to rig up something hold the spindle in place while I turned the nut. I didn't get the drift key with the drill press. In fact, I didn't know what a drift key was until I got deep into this project. I have a large drill press I bought several years ago that came with one. I think I threw it away because I never figured out what it was. 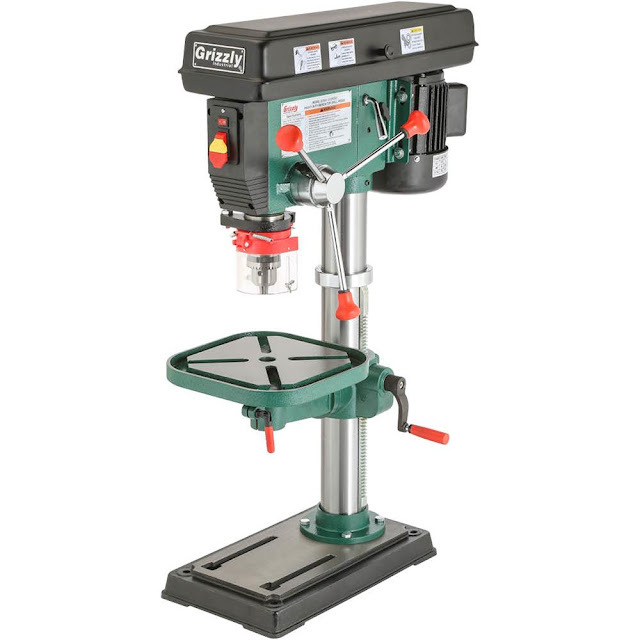 The idea of having two drill presses id to have one for the larger bits and heavy work and one for the small stuff. The big drill press will take up to a 3/4-inch shank bit, but it will not go much lower than 1/4-inch. Scrollsaw work requires a lot of precisely drilled holes 90 degrees to the surface. Some toys also need small holes, and I don't want to be changing chucks every time I drill a hole. The arbor on the drill was scored. It looked like the chuck had been installed with debris on the arbor or chuck and it had slipped. Arbors don't cost much so, I ordered a new one. 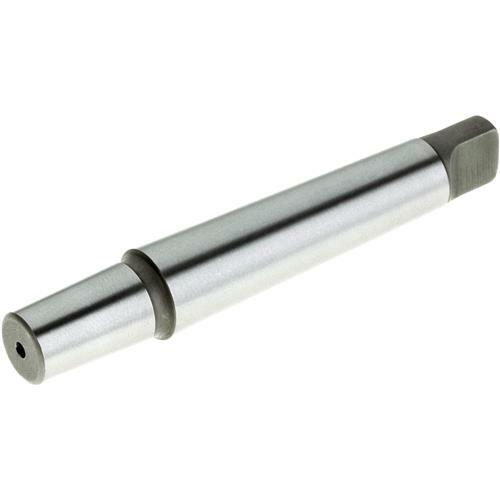 The chuck was metric and far too large for my purposes so I ordered a new one that will take bits down to 1/32-inch. 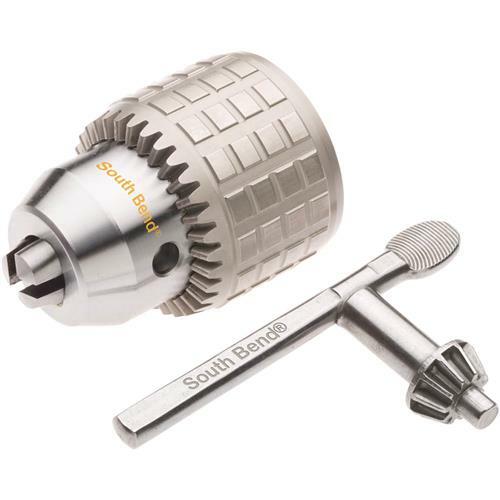 There are some chucks go down to zero but, all of them were keyless, which I don't like on a drill press, and the reviews did not leave me with a warm fuzzy feeling. The companies were all in China and if I got one that I didn't like I would have thrown my money away. I bought mine from Grizzly. I have past experience with their customer service and I know that if there is a problem they will make it right. I all so ordered several knobs some of which had been broken and improperly glued back. You can't glue plastic and vinyl to steel with polyurethane glue. There is a little rust on it that needs to be cleaned up. Mostly on the table where the previous owner had mounted a larger table bare wood against cast iron is asking for rust. Is it worth it? I'll have to wait and see. I haven't drilled a hole with it yet, and I already have a good feeling about this drill press. If it saves me as much time and effort as I expect it too, it will be.